Right now our herd sire program is based solely around Outlawed. In 2014 he swept the HSC and LWC, winning 3 bronzes at each event to go along with his Millennium Futurity Championship and ITLA Championship Futurity win. He didn't slow down in 2015, sweeping the HSC and winning the tip to tip class at the LWC. He also took home the 2015 ITLA Championship Futurity buckle too. We're getting his first major calf crop in 2015 and breeding cows back to him. 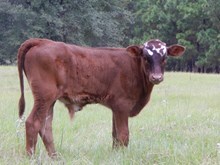 Look at our calves and cows to find something that'll fit what you're looking to do. We're offering these young bulls for sale. They have the opportunity to be a breeding bull as well as a trophy steer. We've sold these prospects for both purposes. Please don't hesitate to contact us about any of these options.